Orthoptists and developmental optometrists both work in the field of diagnosing, measuring and treating binocular vision problems, strabismus and amblyopia. They both use the same vocabulary to describe a problem and even often use the same tools. So why this distinction? I can only speak for certain about the situation in most European countries but I assume this must similar in other parts of the world. In the wonderful book Suddenly Successful I read a while back a fairly detailed history of this branch of vision care was provided. Somewhere during the first half of the twentieth century ‘the great divide’ as we know it today came into being. On the one side you had the orthoptists and ophthalmologists who stuck with the primitive idea that strabismus was only treatable by patching and cutting up eye muscles. On the other side of the fence optometrists started experimenting with all kinds of lenses and procedures in order to see how far they could push natural vision improvement through stimulation and training. Particularly in Anglophone countries this approach gained traction making most notably the USA, but also the UK, Canada and Australia, world wide leaders in this approach to solving visual brain problems. I guess this might be one of the reasons why people like Frederick Brock emigrated from Switzerland to the US, although that is just conjecture on my part. Truth of the matter is that to this day most practitioners of Optometric Vision Therapy have strong ties to the US and are often (partly) trained there. In an average European country, when dealing with strabismus, you are most likely to get in touch with an orthoptist who isn’t educated in improving vision through training. Partly because they vastly outnumber their optometrist counterparts and partly because they are supported by the medical system in every single way while optometrists (depending on the country) are forced to work outside of the health care system. It’s bad for developmental optometrists but it’s mostly bad for the patient. Frankly I don’t care who does the right thing as long as it happens. Because optometric vision therapy is administered off the grid it is not reimbursed, it’s hard to know whether that provider is actually qualified and most importantly the patient is often not informed about the most cost effective treatment for his condition EVEN IF it is not covered. I would like to give you some very clear examples of what a huge difference it makes whether you are dealing with either an orthoptist or a hopefully qualified developmental optometrist. In essence orthoptics is an early less advanced version of developmental/behavioral optometry. I’m not so much going to argue about specific measuring procedures and tests orthoptists utilize. That being said, I know from experience they fail to check for a whole bunch of visual skills but so might many optometrists. No one is perfect. The main reason why orthoptists are ineffective is that when they do in fact detect a number of visual defects they just resign themselves to waiting for it to get worse. Maybe they’ll do some patching in between to give you the impression they are doing something about it. However they are not too worried because once it does get bad enough they’ll call their buddy eye doctor to perform eye muscle surgery. The thing that makes orthoptists primitive is that they are not doing their job based on the best knowledge available. They don’t add value to the life of their patients. I was reminded of this fact by a great cartoon a Dutch strab friend of mine made. Yvette (41) made this based on her own childhood recollections. I thought it was so awesome it was a shame to let it go down the Facebook drain. Have a look. 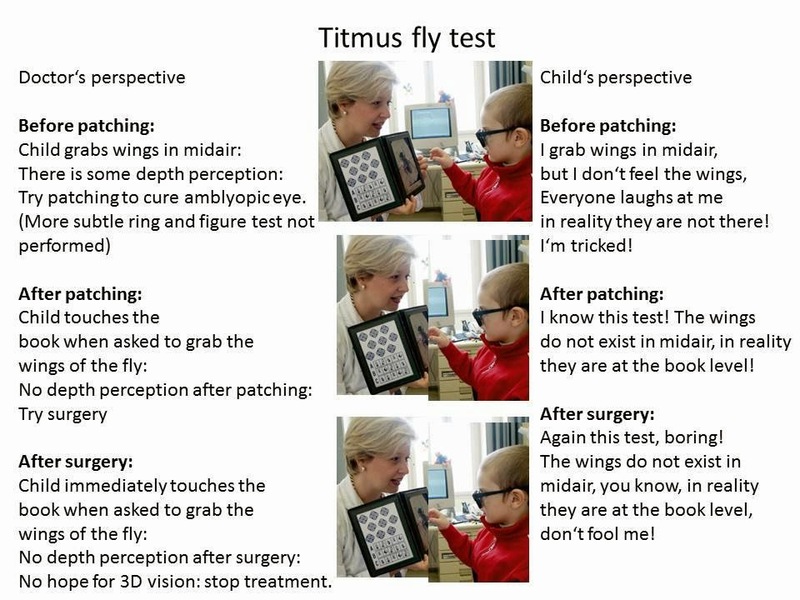 Sadly, this skewed way of treating strabismus is not the past. Earlier I wrote about Emily in Austria who is in the possession of written medical records she did have stereo vision as a child and lost it because of orthoptists not doing their jobs and then making it worse with eye muscle surgery. I too have gone down this road because of ignorance and inactivity among orthoptists. Even more recent I had a Dutch mother named Anoek contact me. Her baby will be one this month. Her daughter developed a squint early on. I told her to have her checked for farsightedness. She went back to the orthoptist in the hospital and asked to look for hyperopia. Her baby was indeed farsighted but this “was completely normal and did not require glasses at this age”. The orthoptist even refused to give a prescription when asked. I stayed in touch with Anoek and urged her to get it corrected to avoid visual deprivation regardless of what the orthoptist said. After a while the child started to consistently turn her head because of the uncomfortable visual stress she was experiencing and trying to relieve. Anoek was alarmed and indicated this to the orthoptist. The woman reportedly answered “Don’t worry about it. It happens. If it gets any worse we’ll correct it with surgery later on. Your daughter can become whatever she wants when she grows up and will live to be a hundred years old.” What a blatant lack of understanding of the nature of binocular vision problems, strabismus and amblyopia. Apparently no one in the north of the Netherlands, not even behavioral optometrists, has the skill or balls to do a proper retinoscopy on a one year old and prescribe appropriate glasses. In the end, Anoek and her daughter will travel all the way to Belgium to get a solid prescription from a behavioral optometrist. How is this possible? I thought we were living in the developed world? Developed for some at least… The costs and opportunity costs of this ignorance and inactivity are huge. Just this week I was talking to my behavioral optometrist about this situation. Isn’t it ironic that I’m about to fall out of the social security system while cleaning up their mess and they are still getting public health care money while causing huge damages by not doing their job? He started singing the Belgian national anthem. It was a witty retort although Belgium is by no means the only country throwing money at people who don’t deserve it. Too bad recovering from strabismus and strabismus surgery while being a ‘strabismus journalist’ is likely to be the least lucrative job ever. However I knów that the true added value of my websites far exceeds whatever many vision care professionals are doing simply because it is centered around the crucial idea of neuroplasticity. If you infect people with the idea it can be done, it can be done. I always liked the idea of going all in and beating the odds, but I never expected to have to do it in this venue. Who would have expected vision care, and by extension life, was such a rigged game for strabismics? I’m still overtaken by surprise every day.